"Clinical assessment of dietary supplementation with Omega-3 polyunsaturated fatty acids indicate their beneficial impact in certain human diseases, particularly those in which inflammation is suspected as a key component in pathogenesis." The Harvard team identified a new class of fats in humans, derived from a fatty acid found in fish oil, which they showed can control inflammation.2 Lead Harvard researcher Dr. Charles Serhan was quoted after the study, "Since we obtained these results I started to encourage my own children to eat foods rich in omega-3 fatty acids." While Omega-3 performs anti-inflammatory activities in the body, Omega-6, on the other hand, largely does the opposite (fires up the immune system and inflammatory response). For millions of years, humans evolved on a diet rich in natural Omega-3 food sources such as fish, nuts, and free-range game. 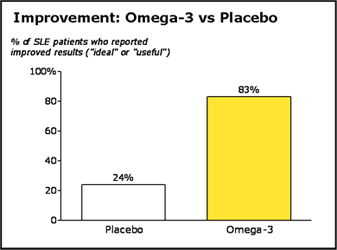 As a result, our Omega-3 (anti-inflammatory) and Omega-6 (pro-inflammatory) fatty acids were in close balance with one another, about a 2:1 ratio. In the last 100 years or so, our diets have changed remarkably with the advent of industrialization. We now consume manufactured corn, soybean, and safflower oils (Omega-6 sources) and much less fish and wild game (Omega-3 sources). Due to our drastic change in diet, we now observe a 25:1 ratio, whereby our pro-inflammatory Omega-6 fatty acids dominate over our anti-inflammatory Omega-3 fatty acids. It should therefore come us little surprise that cultures with high diet intakes of fish rich in Omega-3 such as the Eskimos and Japanese have a low incidence of chronic inflammatory disorders even when compared to their Westernized ethnic counterparts.1 Observant of these interesting correlations, modern science has put Omega-3 to the test through hundreds of controlled clinical trials across a range of diseases. "Participants in the study who were taking fish oil supplements, three times per day for 24 weeks, saw a reduction in disease activity, an improvement in quality of life and reported an overall feeling of improved health by the end of the study compared to those taking a placebo supplement." "Participants taking the fish oil also showed a reduction in fatigue severity, the most debilitating symptom for lupus sufferers." "NSAIDs can cause stomach ulcers and related conditions.The FDA is now requiring expanded information about the risk of gastrointenstinal bleeding on the labels.Large dosages of NSAIDs can also lead to kidney problems and fluid retention, which can worsen congestive heart failure." "Fish oils contain the natural COX inhibitor EPA, which inhibits both COX-1 and COX-2 activity. 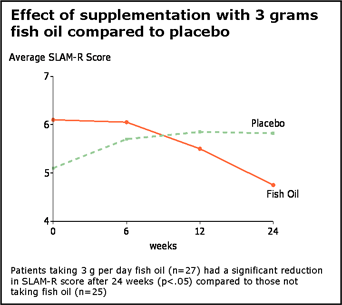 The different effects of EPA and NSAIDs on synthesis of downstream products are consistent with the known cardioprotective effect of fish oil and increased cardiovascular risk associated with NSAIDs (especially those that are COX-2 selective)." Perhaps the most widely known health benefits for Omega-3 involve the heart. The American Heart Association states: "Omega-3 fatty acids have been shown in epidemiological and clinical trials to reduce the incidence of cardiovascular disease."